Chem Pharm Bull (Tokyo). 2004 Sep;52(9):1091-4. Lee JB, Hayashi K, Hashimoto M, Nakano T, Hayashi T.
Faculty of Pharmaceutical Sciences, Toyama Medical and Pharmaceutical University, Sugitani, Toyama 930-0194, Japan. Structural characterization and antiviral activities of fucoidan from sporophyll of Undaria pinnatifida (Mekabu) was examined. The fucoidan was composed of fucose and galactose with an approximately ratio of 1.0:1.1. Degree of substitution of sulfate was 0.72 and its apparent molecular weight was 9,000. Methylation analyses showed that fucoidan had various sugar linkages, and revealed that the fucoidan might have complicated structure. This fucoidan showed potent antiviral activities against herpes simplex virus type 1 (HSV-1), HSV-2, and human cytomegalovirus. Antiviral activity of Undaria pinnatifida against herpes simplex virus. 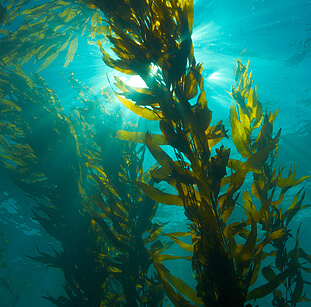 The major component of an aqueous extract of the seaweed Undaria pinnati fi da has been identified previously as a galactofucan (GFS), a sulfated polysaccharide. The galactofucan was partially purified and the material tested in this study is 75% pure galactofucan sulfate. GFS was evaluated for antiviral activity against 32 clinical strains of herpes simplex virus (HSV): 14 strains of HSV-1 and 18 strains of HSV-2. Twelve strains (four HSV-1 and eight HSV-2) were resistant to acyclovir (ACV-R) and 20 strains (10 HSV-1 and 10 HSV-2) were susceptible to ACV (ACV-S). The median IC(50) of GFS for the 14 strains of HSV-1 was 32 micro g/mL. The median IC(50) of GFS for the 18 strains of HSV-2 was 0.5 micro g/mL. GFS is significantly more active against clinical strains of HSV-2 than HSV-1, p < 0.001. The mode of action of the GFS was shown to be the inhibition of viral binding and entry into the host cell. The cytotoxicity of GFS was >4.0 mg/mL in the neutral red dye uptake assay indicating that GFS is non-toxic in this assay. Defensive effects of a fucoidan from brown alga Undaria pinnatifida against herpes simplex virus infection. Hayashi K, Nakano T, Hashimoto M, Kanekiyo K, Hayashi T.
Fucoidan, a sulfated polysaccharide isolated from an edible brown alga Undaria pinnatifida, was previously shown to be a potent inhibitor of the in vitro replication of herpes simplex virus type 1 (HSV-1). HSV-1 is a member of herpes viruses that cause infections ranging from trivial mucosal ulcers to life-threatening disorders in immunocompromised hosts. In the in vivo conditions, the replication of HSV-1 is controlled under the immunoresponse coordinated by both the innate and adaptive immune systems. In the present study, the effects of the fucoidan were examined on in vivo viral replication and the host's immune defense system. Oral administration of the fucoidan protected mice from infection with HSV-1 as judged from the survival rate and lesion scores. Phagocytic activity of macrophages and B cell blastogenesis in vitro were significantly stimulated by the fucoidan, while no significant change in the release of NO(2)(-) by macrophages was observed. In in vivo studies, oral administration of the fucoidan produced the augmentation of NK activity in HSV-1-infected mice immunosuppressed by 5-fluorouracil treatment. CTL activity in HSV-1-infected mice was also enhanced by oral administration of the fucoidan. The production of neutralizing antibodies in the mice inoculated with HSV-1 was significantly promoted during the oral administration of the fucoidan for 3 weeks. These results suggested that oral intake of the fucoidan might take the protective effects through direct inhibition of viral replication and stimulation of both innate and adaptive immune defense functions.